My wife and I have lived in the Apthorp apartments for over 25 years. In the world of rent control and rent stabilization, when you a land a two or ten room apartment at an affordable rent, you determine that the only way you will exit is horizontally – feet first. That is certainly the case at the Apthorp. Several tenants were born here, and for much of our residency, we were the youngsters of the building. It is not surprising that the history of the Upper West Side — indeed the history of New York City — is etched in its six-foot crenelated walls. The building, completed in 1907, was promoted as the largest and most luxurious apartment building in the world. It takes up an entire block from 78th to 79th Street, from Broadway to West End. At the time, apartment living was considered slightly disreputable. Apartments were called French Flats and were inhabited by bachelors and people of questionable ethnicity. Respectable families lived in brownstones with their own respectable front doors. The Apthorp was specifically designed to lure the rich out of their private houses. The lure was unbelievable luxury. Each huge apartment boasted a restaurant-sized kitchen with an iceless icebox cooled by a compression system in the basement, which also housed the building’s own electric generating plant. The apartments had massive, mosaic floored entry halls, numerous bathrooms, gas fireplaces, servant’s quarters in the back halls and on the roof, and an elaborate electrical system so that residents could summon their various maids and butlers at the push of a button. And, in keeping with these so-called good old days, the only way Jews or Blacks could gain entrances to the building was through the service entrance. The unique feature of the Apthorp is its large, airy courtyard. When we first moved here, the building had the feel of a small town with the courtyard being the village common. There you would rub shoulders with celebrities like Cyndi Lauper, Nick Pileggi and Bob Balaban, but everyone living in the building, during what is charmingly known as its period of faded elegance, was interesting. Aging actresses and ballet stars, opera singers, a CIA spy and a gaggle of famous psychoanalysts were our neighbors. We sent our daughter out in the courtyard to play or on treasure hunts through this somewhat spooky building. Halloween was one big party. The building was poorly maintained. Fuses would blow and toilets would leak, but as Nora Ephron wrote so movingly in her piece in the New Yorker, it was really fun to live in the Apthorp in the 70s and 80s, just like it was really fun to live in New York. And then came the real estate boom. The now crumbling building was sold to a Russian/Israeli diamond magnate for an astounding half a billion dollars. You can read all about the Apthorp’s sketchy history in a recent article in the New York Post. Other articles have detailed its legal action against tenants. The stone work at the Apthorp Apartments is being re-pointed including the elaborate statuary. Here a young Apollo tries to ignore the workers. From elegance to decadence, the building is today returning to the new gilded age of the one percent. Huge apartments, split up during the depression, are being recombined. And since seven rooms are not adequate for this 21st century gentry, entire floors are being bought and combined creating apartments with twenty huge rooms. One-hundred-year old tiled bathrooms, mosaic floors and ancient molding are ripped up to install central air conditioning and multicolored LED lighting. The basement now sports a fabulous gym, spa, playroom and party room available only to the new condo owners. And chauffeured limousines deposit these owners into the now highly-manicured courtyard. Like anyone who has lived through the 1950s, with its segregation, sexism and political witch hunting, I am not romantic about the good old days. But I cannot help but be romantic about the Apthorp and indeed about all of the Upper West Side of bygone days. With its quirky people, it was diverse, it was fun and above all it was interesting. And even now, hidden among the limos and behind the newly polished facades of the older buildings, many of us still remain, relics of a more colorful past. Ronald Blumer is a writer for Public Television. Top photo by Howard Lifshitz. Two bottom photos by Ronald Blumer. thank you Ronald, an interesting article and i agree with you. Garbage dumpsters were left in the street for days at a time. Calls to the police and Sanitation did not change management’s attitiude. The annual evening Halloween party in the courtyard went on for hours. Loud amplified music meant for only for the tenants’ enjoyment kept the neighborhood and residents of other buildings awake. What a beautiful, evocative story of life in a very different New York. I miss it. Inheriting something that is absolutely not yours (generations of rent control/stabilization): how will it be explained to future generations? We will explain it a lot easier that allowing billionaire developers to buy the sky and plunge Central Park into shadows! Gee, didn’t know there were still cattle on the UWS ! Why cattle? Because your comment reeks of B–l S–t !!! Exactly WHICH buildings are plunging the park into shadows? When was the last time you were in the park and exactly WHERE and for HOW LONG were there shadows? This writer was in the park Saturday, a day of brilliant sunshine and zero clouds, and the ONLY SHADOWS to be seen came from the magnificent trees overhead. Boy! are you mean! and misinformed! so glad I don’t know you! Buying anything does not require an explanation. Inheriting something that does not belong to you by any means – unexplainable. Can you inherit someone’s leased car? Schizophrenic laws of New York real estate keep the rent inflated (supply/demand) and benefit only those who are the best at gaming the system: “fighting” for their “right” to others’ property for no reason but the outdated law that they abuse with pride. Again you don’t know what you are talking about. No one “inherits” an apartment, rather the right to succession of a RC or RS lease under certain circumstances. This can only be claimed once:surviving spouse, child of deceased parent or parents, or other legally recognized and allowed relationship. For the record domestic partners did not qualify IIRC, hence one of the pushes for legal SSM in NYS. The laws simply recognize you don’t throw persons out on the street simply because the legal tenant of record is now defunct. Something that happened often enough before such protections were enacted. The protections for “non-traditional” family members was felt most keenly by the gay community especially as AIDS ravaged NYC. Survivors who lost long term partners could (and often sadly would) lose their home as LLs asserted they were *not* the primary tenant of record, nor legal spouse of same. Even when New York passed domestic partnership laws the RS/RC code still only referred to legal spouses. Get over it, the “market rate” is a scam and you’re just mad you got ripped off. It was more fun for some people than others. It’s important for writers and other readers to be reminded that not everyone had the experience, opportunities, or shared treasury of memories. That’s what a Comment section is for. Ron- Thanks for a very interesting article about the Apthorp. I’m hoping you and your family are hanging tight…..
We have a great tenant’s committee. Thanks for this. So interesting to get more history about this building that is more recently known for Nora Ephron’s rent battles. Tons of information about “old” NYC architecture. B.B., you are a wealth of re info, thx! The building that I live in is over 100 years old and i get a kick out of researching its past. Reading the original announcement and ads in the NYT for the apartments is fascinating! Have had that site bookmarked and refer to often for years. Can spend hours with a cup of coffee and some snacks. It is interesting to know the history of so many now coveted UWS buildings. Which is why tell people who comment about “luxury” apartments at low rents just do not know. So you lived 25 years in a luxury building at a ridiculously low rent? Now you’re complaining how unfair it is that times are changing? I have no pity for you. I’ll reserve my pity for young professionals who are paying bloated market rents subsidizing folks like you. BTW the reason The Apthorp became rundown is beacuase the owners couldn’t afford to properly maintain a building filled with rent controlled tenants. I agree with your first line. Hostile much? Where were you living for the past 25 years and how were you personally subsidizing this person or anyone living at the Althorp?! You really just don’t know, do you? From the 1950’s or so until really relatively recently (1990’s?) the UWS was a far different place. Just as with the rest of Manhattan things were gritty and dirty with crime everywhere. Many with money were fleeing the City for the suburbs, as such no small number of those grand pre-war UWS buildings were suffering. From CPW to Riverside Drive highly coveted buildings now were often not so much back then. The Ansonia had a gay bar/bath house as part of their commercial space for goodness sakes. RS probably didn’t help many owners of these properties back then, but also it wasn’t exactly killing them either. Concept of “preferential rents” didn’t exist then and even at what you might consider “low rents”, buildings often had problems finding qualified tenants. If it is of any consolation to you the Apthorp went through a bitter and nasty condo conversion back in 2009. It was a great bathhouse, the upper west side was all working class, Puerto Rican, gay, and Jewish. No yuppies around. Bette Midler got her start in the Continental Baths. Do believe one said the baths were in the Ansonia, not Apthorp. Or…or they could take all of their books from years and years of education (surely incurring a significant amount of student loans) down to the street and try to sell them while drunkenly harrassing people??? Mischaracterize much? Like to put words into others people’s mouth whenever possible? Or just can’t help fabricating? i thought it unnecessary to disallow Mr Blumer to feel disappointment in the ripping up of his beautiful building and only allow concern for ‘young professionals’ ((“I have no pity for you. I’ll reserve my pity for young professionals”). By the 1930’s with the great depression holding a firm grip on much of the USA (if not world), desperate times called for desperate measures. No capital for a new building? No problem, chop up those grand five bedroom apartments into smaller units. This would be made a bit easier since even many of those who were well off before 1929 were either wiped out and or had to down size. If the stories one has heard are true, Donald Trump’s father began amassing much of his large real estate holdings around this time. Property owners in distressed circumstances needed to sell, and he had money. I lived for three whole months at the Apthorp. While my relationship didn’t last, my memories of living there will never fade. Lovely article. Thank you. when the west side was alive. An interesting article, but frankly, my nostalgia and sympathy are limited. Even back in the 1980s, the $28,000 in key money Nora Ephron wrote about was well beyond the means of most people. And Ephron was a snob in her own way. By accounts it was $24k in “key money” (ok, bribe), but still your point is well taken. That would be nearly 100k in today’s money. You could make a substantial down payment on a house or apartment with that sort of cash, and actually own something. To give a tenant over twenty grand to “get” their apartment just seems like flushing money down the toilet. For those too young and or not in the know; years ago it was possible to “buy” your way into a RS apartment. You simply paid the current tenant a sum of money, they moved out, you moved in and began paying rent. By law/court rulings once LL had begun accepting rent checks from a different name than tenant of record it became nearly impossible to get the new occupant evicted. Thus sooner or later most LL’s simply offered the “new” tenant a lease under their own name. Sometimes they charged a vacancy increase, sometimes not. But long as you continued to pay rent the only way to get evicted was for the LL to bring a hold-over proceeding in housing court. This sort of thing went on well into the 1980’s and 1990’s; until the RE boom came along. Suddenly LL’s or new owners of properties started combing rent rolls and comparing original leases to names on checks/current tenants. Suddenly people found their rent payments being returned/not depositing and hold over proceedings beginning. Previously it may not have been worth the bother, but with soaring Manhattan rents *and* the chance of newly enacted luxury vacancy decontrol it was a whole new ball game. Luxury decontrol IIRC is what drove Nora Ephron from her beloved Apthorp. So for all those moaning about RS, low rents or whatever the system does work. Ms. Ephron was paying $2k per and since the household income surely was well over the $200 (or was it 2500k?) yearly rent her unit was taken out of RS. Others have had more success. Cyndi Lauper went from paying over 3k for her apartment down to $989 back in 2005. AS A CHILD, I LIVED DOWN THE BLOCK AT 310 WEST 79th STREET, AND ALWAYS MARVELLED AT THE BEAUTY OF THE APTHORP. OVER THE YEARS, I VISITED FRIENDS IN THE BUILDING AND ALWAYS LOVED IT – LOTS OF MARBLE AD BRASS IN THE HALLWAYS. I AM A DYED IN THE WOOL UWSer, STILL ON WEA BUT FURTHER UP. Our building still has the original pipe for the refridgerator ice melt and the floor button under the dining room table to call the maids. Love it! Friends live in a pre-war co-op on Sutton Place. In their kitchen is a small box with a door built into the wall facing the rear courtyard. Having never seen such a thing had to ask; turns out that is what passed for fridge when the building was built. *LOL*. Actually, it was for garbage. Some say it was for veggies but it never was a refrigerator. 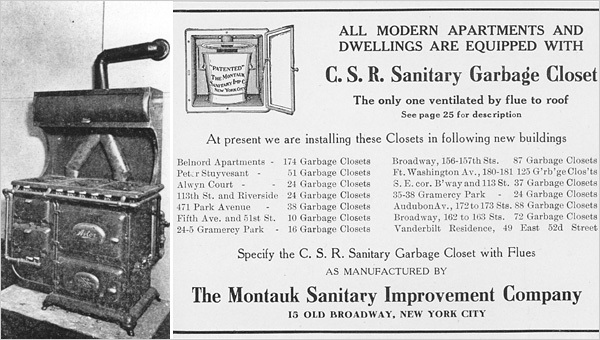 A These peculiar little cubbies — usually one or two cubic feet in size, with one or two iron doors — are often found under the kitchen windows of early 20th century New York apartments. Their original purpose would be easier to decipher if their raised lettering was not so often caked with paint. I don’t understand why you are SHOUTING. Is the Caps Lock key on your computer broken? I was born and raised in New York and have lived on the UWS for a very long time. I’ve never been inside the Apthorp. It would be nice to see it. Sad but true. New York has become nothing more than an investment vehicle for the rich of other country’s cities. Hate to see it go. One of my favorite films shot on NYC location; “Heartburn” used the Apthorp. I assume you know that Nora Ephron wrote the autobiographical novel and screenplay. Yes, I did; thank you. Looked it up after watching the film on television several months ago. Also, Gena Rowlands’ film “Gloria”. Great interior views. Noveau riches, what do you expect of them. Complainer. Not that I think you are the complainer. I do not blame for your sentiment, I agree, I have been an Upper westsider for 50 years, seen them come and gone. But never have I feel the rudeness of this new generation. Not classy. Sad, all that ripping up. While it’s not universal, it does seem that so often, the larger the fortune, the lower the level of taste. Oh I don’t know if the “ripping up” is sad. As noted upthread during hard times and periods of changing fortunes many of the huge apartments in these prewar buildings were cut up into smaller units. Today’s wealthy moving into said buildings are often restoring the original size. In keeping with the fascination of all things French at the turn of last century many of these prewar buildings had units laid out en filade in the traditional way, but also accessible from a hall or corridor. While wonderful for giving a ball or keeping servants out of sight, once you start cutting up units things just don’t flow correctly any longer. Chevy Chase lived there too! Well, not really, but if you’ve seen the movie Funny Farm, Chevy Chase’s character moved from the Apthorp to upstate NY. The Apthorp and 79th St on ramp make nice cameos in the first couple minutes. Congrats on being lucky and humble about your Anthorp rent stabilized apartment. It could not have gone to a more worthy person. Lucky S.O.B. Don’t forget it’s twin…the Belnord at 225 W.86 Street. My home from1945 to early 60’s. it is very sweet to read lovely memories of an ex-nyer now in Beautiful California. Or the Graham Court in Harlem. Nor Astor Court. The Astor family built some of Manhattan’s most gorgeous courtyard buildings. Wonderful article! I’m always fascinated by the Apthorp.